Once again we find ourselves anticipating yet another comic book movie. This time around it is the classic hero, Green Lantern who takes center stage in the tale featuring his origin. Ryan Reynolds stars as the main character Hal Jordan, a test pilot who works for Ferris Air. At the outset we see a familiar scenario play out in which a young boy, who idolizes someone, witness their demise firsthand. The boy is a young Hal (Gattlin Griffith) and it is his father Martin (Jon Tenney) who dies as he is about to test a prototype aircraft. Fast forward to the present and Hal is an adult who, like most young males, can not commit to any one thing in his life. One morning during a test scenario with a new type of pilot-less aircraft, Hal makes a judgment call which costs the company he works for a plane and Hal his job. At the same time, way out in distant space an alien named Abin Sur (Temuera Morrison) encounters an old foe by the name of Parallax (voiced by Clancy Brown). His battle does not go well and in his escape heads towards Earth to select a new recruit. When he crashes he sends out a signal to find one who has the "ability to overcome great fear" and of course this is Hal. When Hal is chosen and given the ring he learns that it is a weapon designed by an ancient race of aliens known as The Guardians. They created the Green Lantern rings and the Green Lantern Corps which is tasked with keeping order and justice in the universe. The rings allow the bearer to turn their thoughts into reality. Hal is taken to the planet OA where he begins training in the use of the ring as well as how to fight. One of his trainers is a very large orange alien by the name of Kilowog (voiced by Michael Clarke Duncan). During his training Hal realizes that he is unworthy of this honor and returns home. Meanwhile back on Earth, Abin Sur's body was discovered by the government and is now being analyzed by a doctor named Hector Hammond (Peter Sarsgaard) who is an old friend of Hal's from childhood. His exposure to the alien body also exposes him to some of the evil energy of Parallax. This energy begins to transform him and of course turn him evil. As Parallax slowly makes his way to Earth, becoming more powerful as he does, Hal must look within himself to find the strength needed to defeat his enemies and save the planet. There was a lot of buzz surrounding Green Lantern and when it finally hit theaters it didn't do as well as most people hoped. That is probably due to the lack of a solid story, and a character history too big for one movie to contain. Like most comic movies now, the performances are fairly thin, all characters, aside from our hero, are relegated to a few short scenes in which we get a vague sense of who they are. The CGI, while good, doesn't really translate well here. The costumes and characters look comical on the screen, even on Blu-ray. Even Reynolds, who is fun to watch can't hold this movie up by himself. Now the movie drops on a 2-disc Blu-ray and is loaded with some pretty good extras. Disc 1 features the Blu-ray versions of the film, one a theatrical cut and the other an extended version. The special features include some deleted scenes, a digital copy of Justice League #1, a movie mode which allows the user to view some back story on the character as the film plays, individual clips showcasing the making of the film and how the actors prepared, a history of the character with interviews from notable writers and artists, a small doc showing how Reynolds prepared physically and mentally for the role and finally a look at the new animated Green Lantern show soon to be airing on Cartoon Network. Over on disc 2 is the standard version of the theatrical film, no extended cut here as well as some of the same features from disc 1. 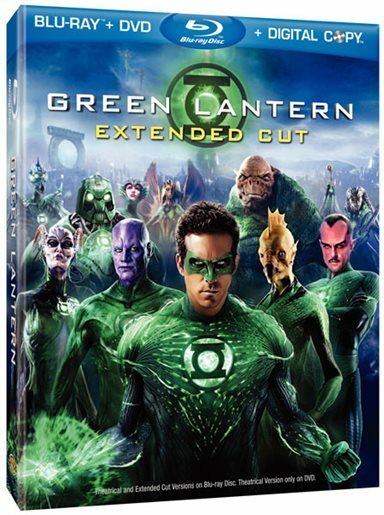 While the film may not have done well and who can say if there will be a sequel, it is quite fun to take a look at some of the features on this disc, most notably the history of Green Lantern and the animated show. It isn't hard to see that the animated show will do well; some formats just work better within the context of animation. Regardless of how the film did, any fan of film and Blu-ray would be delighted to sit back and watch the creation of one of comics most celebrated heroes.